Five exciting excursions in the heart of the territory of Lucca, surrounded by green rolling hills, through authentic and unspoiled landscapes, immersed in nature. Easy ride to discover a unique and unforgettable scenery. And to satisfy the palate a tasting in the cellar, typical snack or a refreshing lunch based on local goodness. Enjoyable stops to admire breathtaking landscapes and enjoy the local food and wine. Bike ride on the walls, priceless heritage and a symbol of our city, in the shade of trees to enjoy an unusual landscape from above and maybe enjoy a comfortable rides to visit the town. Get lost between lanes and alleys to discover the treasures that Lucca embodies or decide for the ride outside to admire the Majesty of the ring wall, born as defensive and then transformed by Maria Luisa of Bourbon in outdoor public. Then off to River Park, protected area of great naturalistic interest with areas equipped for sport and relaxation. It follows the river northward to reach cells in Pescaglia, the small village of origin of the Puccini family, or South to Blackpool and continue towards Torre del Lago Puccini, where in his villa master composed many of his most famous works. This coincides with the "walking and cycling" dedicated to Giacomo Puccini. Route suitable for MOUNTAIN BIKING that winds in the hills North of the city. Starting from Pandit in Monte s. Quirico town rises the chapel until around enjoying the wonderful landscapes offered by generous Hills through villages and picturesque villages on dirt strokes going up to the top of a hill called Maldonado where you can still see an old signalling Tower of the defensive system of the territory of Lucca. Down in the following Morianese "fruit road" typical of that culture and territory along the right bank of Serchio we return again to Monte s. Quirico. 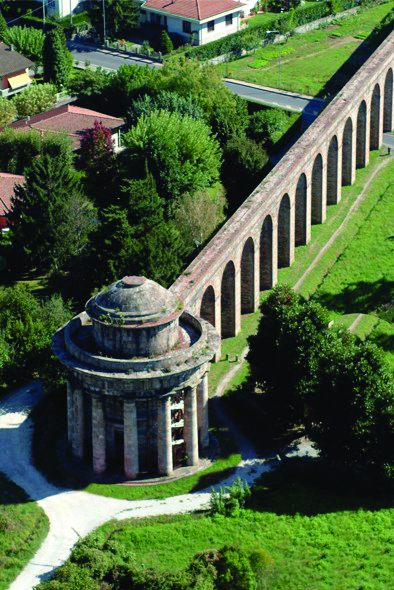 South of town, in the immediate outskirts, develops a path along the aqueduct (hydraulic complex built at the behest of the Duchess of Lucca Maria Luisa of Bourbon on a project of the Royal architect Lorenzo Nottolini-1822). This route climbs towards the springs called "Golden words" and continues in the area of Compitese on the slopes of the monti Pisani where the spring water is the main element of the itinerary. Returning to the town, it crosses an area between the towns of Lucca Capannori formerly occupied by a large water basin, the Lake of Bientina, now reclaimed. On this path you can meet Etruscan and Roman archaeological sites located on the edge of the lake itself. The route divides into two distinct paths. The first line in the direction of salt Mutigliano Pieve di Santo Stefano crossing one of the areas of greatest production of wine and oil of Lucca, high quality (these hills are, for the extremely particular microclimate suitable for the cultivation of vines and olive trees). It goes north to the Val Freddana then go back to the Place and on the way back towards Lucca along a stretch of the ancient Via Francigena which led the pilgrims in their journey of faith to Rome. The second path, alone or as an extension of the first, climbs on other hills along a mystical place "la Certosa di Farneta" (the second in importance after that Italy Pavia) totally visible from the top of the parish of Formentale. Continue towards hilly location, gracious Chiatri, where Giacomo Puccini built a villa overview from which to admire the Versilia coast with its beautiful sunsets over the sea. Returning to town along Hwy Sarzanese Valdera to Ponte s. Pietro and then, through the Park, River reach Monte s. Quirico. Also in the South of the city runs another suggestive path that leads to the slopes of the hills that separate the plain of Lucca from Pisa and passes through ancient villages with Romanesque churches testimony of the oldest settlements outside the city. In these border areas are visible the remains of fortifications and historical fortresses vestiges of military strife between Lucca and Pisa. The most obvious example is the passage of Ripafratta with opposing fortresses of the two cities. Continuing the path, the same for a short distance coincides with the walking and Puccini, then over to the remains of Massaciuccoli Roman baths where you can still see a mosaic almost completely intact. After a fairly demanding ascent you descend again towards the plain of Lucca and you reach the colle di Nozzano where stands the medieval tower of the Castle where the houses, ready to ring, they form the ancient village. The path back to Lucca, to discover the ancient Pieve di Arliano, one of the oldest in the area. Finally, through River Park to the city.